Cmu compressive strength is the psi calculated from the net area of the individual unit. The minimum average net compressive strength per ASTM C90, as of the 2014 edition, is 2000 net psi. Previous editions of C90 indicated 1900 net psi. f'm, specified compressive strength of masonry, is the value used in design of the masonry wall. This is the strength specification that really matters, as it is the strength upon which the structural design is based. Notice it is the strength of masonry, not units. It is the compressive strength of the assemblage of masonry units, mortar, and grout. California Building Code (CBC) Sections 2105.1 and 2105A.1 refer to TMS 602 for compliance with the specified f'm value. One of two methods must be used (not both): 1) unit strength method or 2) prism test method. Unit strength method. Code allows an "assumed" value of f'm to be selected based upon specifying the net compressive strength of the masonry unit. (TMS 602 Table 2.) Unit strength relies on individual cmu and masonry grout strengths, and the type of mortar. For example, specifying a high-stress unit at 3250 net psi, an f'm of 2500 net psi would be allowed without substantiation by prism test. Note: CBC Section 2105A.2.1. does not allow the unit strength method for design strengths over 2000 net psi. Prism testing must be used. Prism testing. Although prism tests may require a bit more coordination in project management, compression testing of prisms does offer the most accurate verification of f'm. 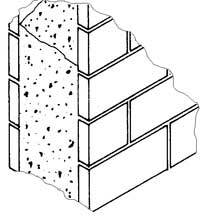 A prism is a sample assemblage of masonry units, mortar joints, and grout similar to the one shown. When the f'm value exceeds 2000 net psi, we recommend specifying the f'm as required by design and verifying compliance by means of prism testing. In this way, testing more reliably portrays actual construction, and full values are realized in design and materials. Prism testing also allows the contractor to submit and supply a combination of cmu and grout most advantageous for the project schedule. The conservatively high cmu values utilized by the unit strength method may force materials to be made on special order with significant lead times. Many times, however, the f'm can be satisfied by available materials coupled with an appropriate grout strength.